Mahdi Yousefi was awarded the Healthy Starts Graduate Studentship for his thesis project “Safe automated anesthesia drug delivery”. Ainara has been offered a tenure-track position at Twente University. She will be making the move to the Netherlands in April 2016. Nazanin Hamzei was awarded a Mitacs Accelerate Graduate Fellowship. She will be interning with Motion Metrics International Corp for her project on “Deep Learning Analysis for Missing Tooth Detection in Mining Monitoring Systems”. Mark Ansermino gave a presentation at the first World Sepsis Day Event held at VGH on “Phone Oximeter use in sepsis diagnosis and care in developing countries.” Visit www.world-sepsis-day.org for more information. Parastoo was awarded a MITACS Accelerate fellowship with LGTmedical. She will be working on “Sleep Apnea Screening Algorithms for Pulse Oximetry Utilizing Analog Sensors on a Mobile Device”. Drs. Mark Ansermino, Guy Dumont and Richard Merchant were interviewed by CTV news, about the iControl project, and its relevance to the future of anesthesia. The first fundraiser for the Sensor Project was held on May 28, 2015, raising more than $13,000 for a life-saving initiative in the developing world led by UBC clinicians and scientists. The team received an Alva Foundation award to evaluate use of the Phone Oximeter for at home evaluation of obstructive sleep apnea in children. We can’t wait to get started! RRate app has been selected as a recipient of a 2015 Connected to the Community Award for its use of wireless technology to improve the lives of Canadians. This award is an opportunity for the Canadian Wireless Telecommunications Association to pay tribute to outstanding organizations in recognition of their partnerships with Canada’s wireless industry. The award ceremony was held in Vancouver on April 16, 2015. Ainara Garde travelled to Seoul, Korea for the World Congress on Sleep Medicine. She presented: Detection of Sleep Apnea Events in Children Using The “Phone Oximeter” and received the Young Investigator Award. Congratulations to Ainara Garde and Peter Harper for receiving one of three 2015 Clinical and Translational Research Seed Grants for their project titled “Validation of the Phone Oximeter as an at-home sleep apnea screening tool for children”. Congratulations to Joy Dawes, Dorothy Myers, Matthias Gorges, Guohai Zhou, Mark Ansermino and Carolyne Montgomery for their article entitled “Identifying a rapid bolus dose of dexmedetomidine (ED50) with acceptable hemodynamic outcomes in children” as the Pediatric Anesthesia Editor’s Choice article. Congratulations to Walter Karlen, Dustin Dunsmuir, Heng Gan, Michelle Chiu, Guy Dumont, and Mark Ansermino for the 3rd place (Bronze) award for their work on “RRate: An innovative respiratory rate counter for the point-of-care” at the Mobile Health & AAL Challenge (MobileMed 2014) competition in Prague, Czech Republic. Congratulations to Matthias Gorges, Zoe Brown, Lindsay Rawling, Gill Lauder and Norbert Froese for their success in their respective projects in the iACT Trainee Clinical Investigator Seed Grant Competition. These seed grants will be an important source of funding to get these projects up and running. Thank you to iACT for continuing to support our team. Joanne Lim (Research Manager), Walter Karlen (Post-doctoral Fellow) and their daughter Isabelle are off to start a new chapter and adventure in Switzerland. Joanne has been with PART/ECEM for almost 10 years and Walter for 5 years. Walter has received a Swiss National Science Foundation (SNF) professorship grant at the Swiss Federal Institute of Technology in Zurich (ETHZ). We thank them for their contributions over the years and wish them luck in their new home! Guy Dumont, Walter Karlen and Ainara Garde made the trip to Chicago, USA to present and network at the annual IEEE Engineering in Medicine and Biology Society international conference. Walter and co-authors: Ainara Garde, Dorothy Myers, Mark Ansermino, Guy Dumont, Cornie Scheffer were subsequently awarded a Top 20 for their work entitled “Respiratory rate assessment from photoplethysmographic imaging” and invited to publish their work in the IEEE Journal of Biomedical and Health Informatics. Congratulations to Matthias Görges on garnering the prestigious UBC Killam Post-Doctoral Fellow Research Prize! This is awarded annually to two UBC postdoctoral fellows for outstanding research and scholarly contributions. Our team received some press with the recent publication of “Improving the Accuracy and Efficiency of Respiratory Rate Measurements in Children Using Mobile Devices” in the open access journal PLOS One. Authors are Walter Karlen, Heng Gan, Michelle Chiu, Dustin Dunsmuir, Guohai Zhou, Guy Dumont and Mark Ansermino. The manuscript describes a new method for quickly measuring respiratory rate (up to 6 times faster than the current manual method). Mark Ansermino, Peter von Dadelszen and Tom Walker (representing LGTmedical) attended the global summit on maternal, newborn and child health. This event hosted by Prime Minister Stephen Harper included Canadian stakeholders and global leaders from developing countries, donors, private sector and foundations. The team showcased our latest innovations in mobile health diagnostics. Congratulations to Walter Karlen for winning 2nd place and the Post-doctoral category at the CFRI Minute (and a Half) to Win It research presentation competition. Trainees had 90 sec to describe their research in a format to practice their concise presentation skills. Congratulations to Walter Karlen for winning the 2013 UBC Killam Post Doctoral Fellow Research Prize! Established in 2011, this prize is awarded annually to two UBC PDFs in recognition of outstanding research and scholarly contributions while at UBC. Congratulations to Parastoo Dehkordi (and Ainara Garde for presenting) and the authors (Walter Karlen, Mark Ansermino, Guy Dumont) for the Best Poster Award for their paper entitled “Pulse Rate Variability in Children with Sleep Disordered Breathing in Different Sleep Stages”. News release on LambdaNative, our open-sourced (BSD licensed) core Gambit-C based development framework for producing cross-platform applications on Android, iOS, OS X, Linux, Windows and OpenBSD.Congrats to developers: Chris Petersen, Matthias Görges, Dustin Dunsmuir, Mark Ansermino, and Guy Dumont. Congratulations to Ainara Garde for receiving a CFRI Postdoctoral Fellowship. Congratulations to our summer students Mazy Abulnaga and Michelle Chiu for both winning Best Poster Awards (Clinical Research) in their respective groups! Thank you to their supervisors and the PART/ECEM teams for providing the support and encouragement for our students. Congratulations to Nicholas West, Guy Dumont, Klaske van Heusden, Chris Petersen, Sara Khosravi, Kristian Soltesz, Aryannah Umedaly, Eleanor Reimer, and Mark Ansermino for receiving the Pediatric Anesthesia Editor's Choice Article for "Robust closed-loop control of induction and maintenance of propofol anesthesia in children". Congratulations to Matthias Gorges for receiving the CFRI Outstanding Achievement by a Postdoctoral Fellow award. The award recognizes the outstanding achievement of a postdoctoral fellow whose high academic achievements, personal leadership qualities and demonstrated research ability show promise of the individual becoming a future leader in health research. Congratulations to Matthias Gorges and Simon Whyte for receiving an Innovations in Acute Care and Technologies Trainee Clinical Investigator Seed Grant Award for their proposal “The effect of preoperative warming on surgical complications in pediatric scoliosis repair: A retrospective quality improvement study”. Congratulations to Guy Dumont and Mark Ansermino (and collaborator Ian Mitchell – UBC Computer Science) for their success in the NSERC/CIHR Collaborative Health Research Program (CHRP) for the next steps in the iControl project. Guy Dumont and Mark Ansermino, along with investigators Anne Junker and JP Chanoine, were awarded a grant from the Peter Wall Solutions Initiative (PWSI) for a youth engagement initative, KidsCan. They will develop a smartphone application (MobileKids) that will help promote voluntary physical activity and healthy eating habits among youth. Congratulations to Mark Ansermino for being awarded the UBC Faculty of Medicine Distinguished Achievements Award for Excellence in Clinical or Applied Research. 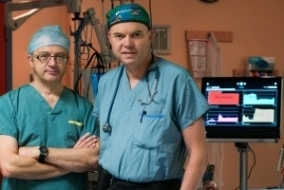 Mark is the first anesthesiologist to win this award. 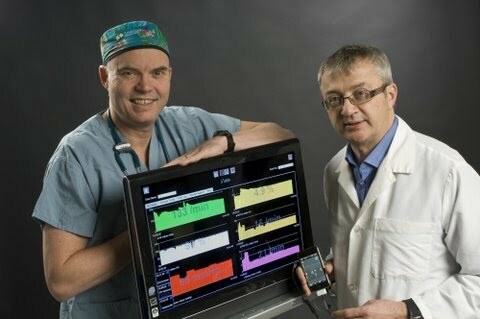 Congratulations to the ECEM on obtaining an NSERC grant: Equipment grant for mHealth application laboratory. This grant will help the group to establish a lab with the necessary equipment to conduct the latest research and development in health applications. Congratulations to Srinivas Raman, Chris Brouse, Walter Karlen, Mark Ansermino, Guy Dumont for wining the 1st prize in the Computers in Anesthesia Engineering Competition for their work entitled "A Data Fusion Approach for RR Estimation from PPG" at the STA meeting. Congratulations to Chris Brouse (and co-authors Walter Karlen, Guy Dumont, Dorothy Myers, Erin Cooke, Jonathan Stinson, Joanne Lim, Mark Ansermino) for winning the Best Clinical Application of Technology with their work entitled "Measuring Adequacy of Analgesia with Cardiorespiratory Coherence" at the 2012 Society for Technology in Anesthesia annual meeting! Walter Karlen has submitted an application to Grand Challenges Canada in the Canadian Rising Stars in Global Health program. With the Camera Oximeter project, we aim to reduce the cost of pulse oximeters by using the integrated camera of the mobile phone as the sensor. This novel approach could be used for diagnosis of sepsis and pneumonia in remote locations in low and middle income countries. Please vote for the Camera Oximeter project at: Canadian Rising Stars in Global Health. Voting ends November 11, 2011. With the launch of the new iPhone, please consider donating your used iPhones and/or iPod Touch to our research efforts. Thanks go to everyone who has helped us along the way! Your support is much appreciated. Congratulations to Matthias Görges on receiving a CIHR Post Doctoral Fellowship award. He will be working on his project entitled Development and Evaluation of a Mobile Patient Monitoring Device for Nurses in the Intensive Care Unit. Members of the PART and ECEM participated in the annual CFRI Student Research Forum. Congratulations to Emma Whyte, Gill Lauder, Ashley Robinson, Joanne Lim, Nick West, and Mark Ansermino for the 1st place prize in the Clinical Fellows category for their work entitled "Caudal Ultrasound: A Safe and reliable way to identify local anesthetic in the infant caudal epidural space". Congratulations also to Christopher Brouse, Guy Dumont, Dorothy Myers, Erin Cooke, Joanne Lim, and Mark Ansermino for the 1st place prize in the PhD student category for "Wavelet transform cardiorespiratory coherence for monitoring nociception". Congratulations to Jacqui Hudson, Specky Kimenye, Walter Karlen, Guy Dumont and Mark Ansermino for their award winning abstract entitled "Usability testing of a prototype Phone Oximeter with healthcare providers in high and low medical resource settings" at the annual UBC Department of Anesthesiology, Pharmacology and Therapeutics Research Day. Jacqui did an oral presentation of their abstract in the Anesthesia Resident's category. Congratulations also to our other PART presenters Matthias Gorges, Walter Karlen, Emma Whyte, and Pamela Winton. Congratulations to Matthias Görges for winning a "Best of Category" (Equipment/Monitoring) at the International Anesthesia Research Society (IARS) annual meeting for his abstract "Development of a Mobile Monitoring and Communications Solution for Anesthesia Team Members". Congratulations also to abstract co-author Mark Ansermino. Congratulations to members of the PART and ECEM on their 2nd place award at the International Anesthesia Research Society (IARS) annual meeting for their Scientific and Educational Exhibit on "Intelligent Anesthesia Technology". Thanks to Matthias Gorges, Walter Karlen, Joanne Lim, and Chris Petersen for preparing the demos and manning the booth. Congratulations to members of the PART and ECEM on the world premiere of the musical promotion of the Phone Oximeter on YouTube. Please "Tweet, Facebook, Like" and send to all your friends and family. A big thank you to everyone involved! Congratulations to Dr Mark Ansermino and Dr Guy Dumont for winning the 2010 Brockhouse Canada Prize for Interdisciplinary Research in Science and Engineering. This prestigious NSERC award recognizes outstanding Canadian researchers who combine their expertise in engineering and sciences. Congratulations to Dr Simon Whyte for winning the Best Oral Abstract award at the TIVA-TCI 2011 World Congress of Total Intravenous Anaesthesia and Target Controlled Infusion in Singapore for his abstract on A pilot study to investigate plasma bupivacaine concentrations in children receiving total intravenous anesthesia and caudal analgesia. Congratulations also to co-authors Dorothy Myers, Mary Ensom and Diane Decarie. Congratulations to Dr Walter Karlen for garnering the Excellence in Technology Award at the Society for Technology in Anesthesia Annual Meeting in Las Vegas, USA for his abstract on Location independence in patient monitoring. Congratulations also to co-authors Mark Ansermino and Mike Blackstock (MAGIC at UBC). Check out our latest developments about the Phone Oximeter project. Congratulations to Dr Simon Whyte who received 2010 Telethon Awards Competition research funding for A pilot study to investigate plasma bupivivaine concentrations in children receiving total intravenous anesthesia and caudal anesthesia. Dr Mark Ansermino presents "The Future of Personalized Sensors for Health & Disease" at the BC Wireless Health Forum sponsored by DigiBC. Congratulations to Dr. Walter Karlen who presented Capillary Refill Time Assessment Using a Mobile Phone Application (iRefill) at the 2010 American Society of Anesthesiologists (ASA) annual meeting. This abstract won the Best Abstract Award for the Society of Technology in Anesthesia (STA) Excellence in Technology Innovation. Congratulations also to co-authors Drs. Chris Petersen, Amelia Pickard, Guy Dumont and Mark Ansermino and the rest of the team! Our submission entitled "Cell phone oximetry workshop: Canadians working towards improved anesthesia safety around the world" was awarded a grant from CIHR Meetings, Planning and Dissemination Grant: Circulatory and Respiratory Health. We will be organizing a workshop early in 2011. Congratulations to Dr. Simon Whyte for presenting “Evaluation of the Intubating Laryngeal Airway in Children” at the 14th Annual Society for Airway Management (SAM) Scientific Meeting (September 24 – 26, 2010). The abstract received the 2nd Place Award (of 88 submissions). Congratulations to our ECEM recipients of the 2010 iACT Grant Competition research funding. iACT (Innovations in Acute Care & Technology) is a research cluster of the Child & Family Research Institute (CFRI). 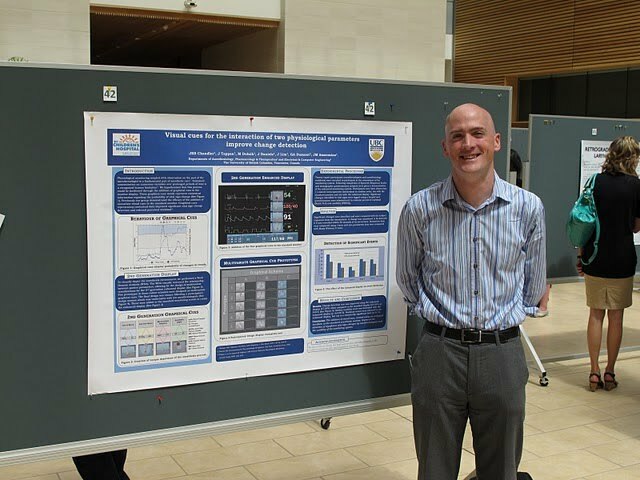 Congratulations to Dr. John Chandler in his success at the UBC Department of Anesthesiology, Pharmacology and Therapeutics (APT) 4th Annual Research Dayfor winning 1st place in the Fellows division in the oral presentation competition ("Arterial and plethysmograph waveform relationship in children: two sides of the same coin? "), and 1st place in Anesthesiology in the poster competition ("Visual cues for the interaction of two physiological parameters improve change detection performanace"). Congratulations also to Dr. Amelia Pickard for presenting "A novel method of measuring capillary refill time using photoplethysmography" and Jeremy Daniels presenting "The effectiveness of standard pediatric daycare surgery discharge communication: a quality improvement gap analysis". Click the link for more information on the 2011 Society for Technology in Anesthesia Engineering Challenge See Pdf for more information about the competition. Competition is open to all students. Walter Karlen has been awarded the CIHR Fellowship for "Smart analysis of exhaled carbon dioxide: algorithm development and clinical evaluation". Congratulations! Walter Karlen has been awarded the prestigious Child & Family Research Institute (CFRI) Postdoctoral Fellowship for 2010. Congratulations! Our project entitled "eVENT: An expert system for detecting ventilatory events during anesthesia" has received a grant renewal from the Canadian Institutes for Health Research . Congratulations to Mark Ansermino, Guy Dumont, Sid Fels, Stephan Schwarz, Peter Choi, and Valentyna Koval! CapnoBase, a respiratory signal database for research developed by ECEM members, has been published. We invite researchers all over the world to contribute by uploading interesting respiratory signals. ECEM at the 2009 ASA! 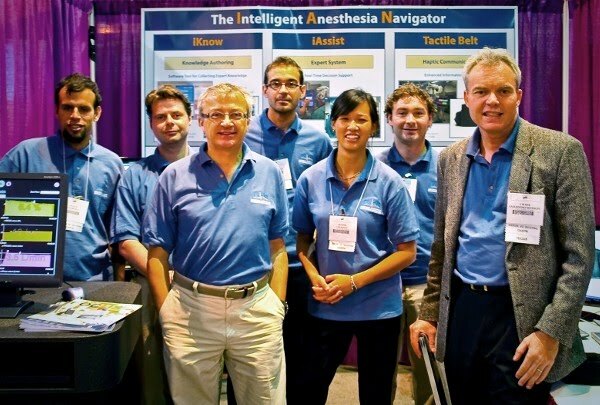 We presented a Scientific & Educational Exhibit featuring "The Intelligent Anesthesia Navigator". Our booth was very well received by the conference attendees and was judged amongst the 45 entries to receive the 2nd place award! Thank you to everyone who contributed to our success!! ECEM group's research on intelligent anesthesia monitoring and decision support features the cover article of FOCUS magazine. PDF of the article. ECEM has a new webdesign. enjoy! ECEM medical student Jeremy Daniels wins the CFRI Best Poster Award with his poster A web-based adverse event reporting tool for families. The knowledge authoring tool can be downloaded from Flintbox. See website for more information.